We want to share an incredible scoop with you! 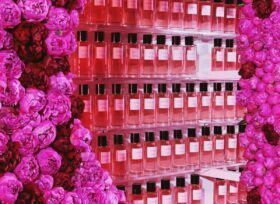 Holy Peony is the newest perfume by Dior. It's inspired by the enchanting fragrance of perfect peonies. My Peony Society delivered the peonies for this festive launch. The launch was not only exciting for Demachy, but also for My Peony Society. In the middle of the week of Valentine’s Day, we were asked to deliver high-quality peonies for a big, special event. We didn’t know what event. We did know that the request was huge for that time of the year. Peonies are scarce around Valentine’s Day. That meant that we had to pull out all of the stops. The showpiece of the launch was a peony swing, created by By Appointment Only Design. This alluring swing was made with blooming Dr Alexander Fleming and Henry Bockstoce flowers. We want to thank our customer Rijnsflowers and our fantastic growers for being able to be part of this launch. Their craftsmanship makes it possible to create such a beautiful showpiece early in the year. Peonies can make you fall in love like no other flower. They enchant you with their bright colours and subtle but complex smells. That should seduce everyone, right? Perfumer François Demachy must have had the same thought. We surely understand him. Read more about Holy Peony and our peonies!